You have to draw a line somewhere, right? And we’re a funny species…we draw lines everywhere. But lines, once drawn, just ache to be crossed. I’m not excusing this conduct, I’m just saying it seems to be a pattern of human behavior, or human misbehavior anyway. So when you build a massive defensive fortification on your country’s border–though it may be a project of mind-boggling innovation and preparation, though it may seem impenetrable–well, it just seems like pressing your luck to call it The Maginot Line. You are just begging for trouble. But, of course, no one had to go begging for trouble in Europe in the late 1930’s. Trouble sat on your doorstep with a capital T. And I’m sure all of France slept better at night knowing that the Maginot Line held its eastern border safe when the Third Reich escalated its rumblings in Germany. Slept. . . until the rumblings got louder and louder. Until countries to the east fell: Austria, Czechoslovakia, Poland. Then the north: Norway, Denmark. The border: Belgium. Until the line did not hold. For the most part, our local expeditions these first two weeks in Germany have been uncomplicated: vintage car shows and pastry shops. . . and more pastry shops. Mindless, sleek, or sugar-and-cream-filled offered a nice counterpoint to the stress of the frantic first two weeks: jet lag, radical re-orientation, frantic house hunting, and a litany of drivers’ tests, briefings, and meetings. But as life is beginning (just beginning) to normalize, it seemed time to pull our heads out of their eclair-induced stupors and really SEE something. And the first something that we really ventured out to see was pretty heavy stuff–perhaps not so much as a statement of gravitas on our part, but just owing to proximity and rainy weather. We ventured just over the French border to Simserhof, to tour a fabulously intact section of the Maginot Line: a series of unfathomably huge underground fortifications that were built to defend the French border from the sort of threat that had manifest itself in the nightmarish realities of World War I. 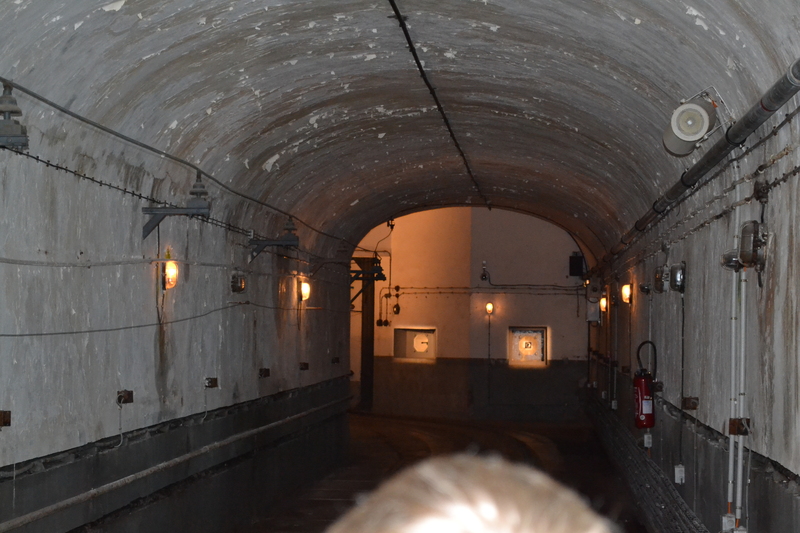 A tunnel into the living and working areas underground at the Maginot’s Simserhof location. For all of the brilliance of these fortifications–and they are truly amazing–the battle that arrived at their doors was not the First World War’s long drawn out trench warfare, but some new beast. Where “the line” was static and uber-hardened, the blitzkrieg was fast, arguably precise, and offered an element of surprise. And surprises abounded: many thought the Ardennes Forest of Belgium was impassable to German tanks. Mistake. The Ardennes proved passable, and because of the break in Maginot line (it did not run along the border of Belgium), the Germans simply came around the fortifications. I wish I had taken more photos inside the facility, as it was fascinating and extravagant— not in it’s lavish interior (the interior was austere) but in the audacity of its scale and hopefulness. It is like a military base built underground–with weapons and munitions, electrical generators, a “trolley system,” a filtration system for gas attack defense, multiple levels and elevators, chow halls and a modern (for its time) kitchen for officers, a pantry stocked with wine and cheese, bunk rooms, a state-of-the-art infirmary, etc. It was optimistic: after the hellacious First World War, this facility contained the hopes and promises of a secure border and a fighting force that could be effective from the shelter of a secure and dry “trench” stocked with coffee and wine, with relatively warm beds, with fresh air to breathe, full bellies, dry limbs, etc. It was a desirable set up, but flawed. War is a trickster and a shape shifter, and the Maginot Line was inflexible. I didn’t take more photos because my hands were shoved into my pockets and shaking. This underground facility is very cold! Our walking tour lasted maybe an hour, and the chill had plenty of time to seep into my bones. If one hour of subterannean life and lack of sun can do this to you, what would it be like to be underground for months on end, even without a battle raging above and around you? Mmm, I shudder just thinking about it. It’s a somber subject, but a fascinating place to visit. 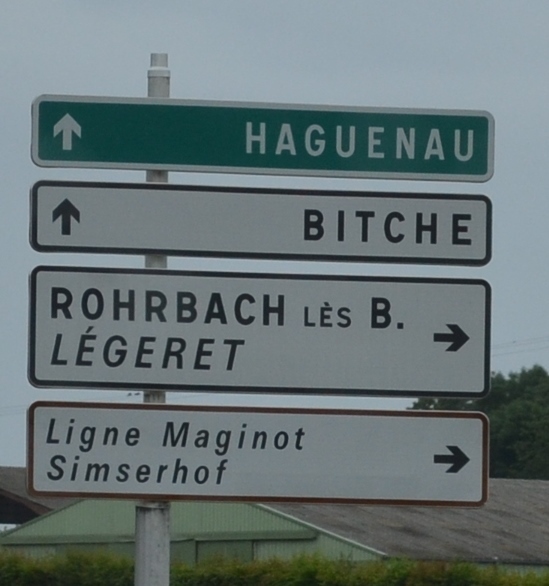 Simserfhof is located in Northeastern France, near Bitche (yes, Bitche) just over the border with Germany. Bitche offers it’s own sights to see–most notably its citadel on a hill. 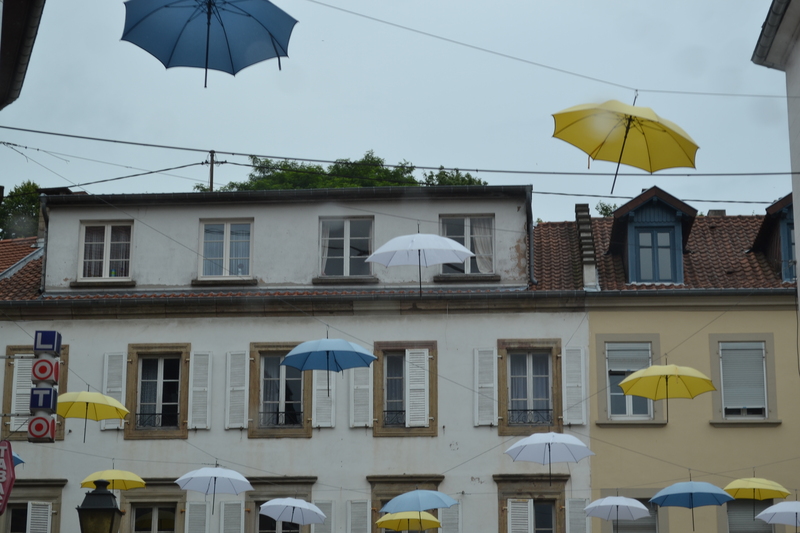 It was too rainy for us to tour the Citadel yesterday, but we drove through the town on our meandering way back home, and were delighted to see the following art above one of the town’s squares. A little levity was just what we needed as we left the Maginot Line and planned our own attack on the pastry counter of the Cora Market. It is worth seeing–we really enjoyed it, and brushed up on some history. But do take a jacket…or two. It’s very cold underground!